Overlooking a magical sea temple and the dramatic black sands of Cemagi Beach, Villa Semarapura offers a one-of-a-kind holiday experience on Bali’s sunset coast. This beautifully designed villa features five luxurious bedroom suites and a wide choice of living, dining and entertainment areas. Sip an ice-cold beer at the poolside bar, relax with a massage, or enjoy cocktails in the sunset balé as the sun slips below the horizon. 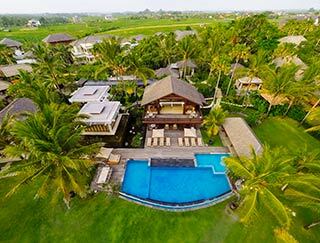 Despite its delightful away-from-it-all setting, Villa Semarapura is within easy reach of the picturesque Pura Tanah Lot and only 15 kilometres from Seminyak. Although with an excellent team of staff on hand – including a skilled chef – why leave? 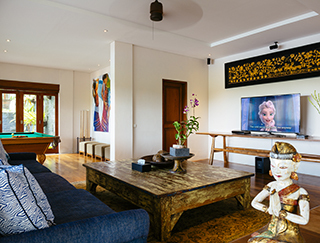 Villa Semarapura comprises a series of attractive pavilions spread over 5,000 square metres of gardens. From the villa’s Balinese entrance a covered walkway leads to the upper level of the spectacular ocean-view living pavilion at the heart of the estate. To the side lies the dining pavilion, kitchen and a double-storey building housing two of the villa’s five bedroom suites. Below the living room, a large media room opens onto a sun deck bordering the 20-metre swimming pool, with pool pavilion and bar lounge to the side. Within its own private garden lies the master bedroom suite, behind which are two more guest bedroom pavilions. 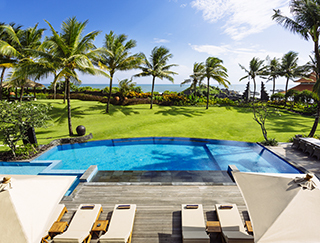 Within the gardens are a massage balé and, at the highest point of the estate, a sunset balé overlooking the ocean. All five spacious air-conditioned bedrooms at Villa Semarapura feature teak floors, sirap (ironwood) tiled roofs, paddle fans, King Koil mattresses, blackout and sun curtains, and air-conditioned black granite bathrooms. Each suite is equipped with a satellite TV, DVD player and Bose sound dock. Flanked by water features and screened by statement architectural plants, the decadent master suite accords couples the most romantic and enticingly private retreat. The grand canopied king-size bed faces a comfortable lounge area decorated with silk furnishings, antiques and Indonesian art. A wall of glass sliding doors opens onto a large ironwood deck with Jacuzzi/plunge pool, double sunbed and breakfast area. In the gorgeous bathroom with walk-in rain shower and twin vanity, a large bathtub for two sits within a glazed alcove looking onto a private courtyard garden with alfresco shower. Set at right angles to one another, each in its own pavilion, are two guest suites accessed across a lotus pond dotted with fountains and sharing a shaded pergola with daybed. Huge mirrors have the effect of doubling the size of these already spacious rooms, which are each furnished with a four-poster king-size bed, comfortable sofa and writing desk. The ensuite bathrooms and dressing areas are fitted with granite-rimmed bathtubs, walk-in rain showers and private gardens with alfresco showers. Stunning sea views distinguish the two guest bedrooms in the double-storey wing. Ideal for families, the rooms are linked by an internal staircase. The upper bedroom has its own entrance lobby, a second lobby with bar fridge and kettle, and a dressing area fitted with a wall of wardrobes and a trundle bed for two nannies. The bedroom, furnished with king-size bed and window seat, opens onto a private sea-view balcony with daybed and breakfast table. The large bathroom is fitted with a bathtub, twin vanities, walk-in rain shower and garden shower. The bedroom below, with twin beds that can convert to a king and a bathroom that mirrors the one above (without the garden shower), opens onto a large terrace.